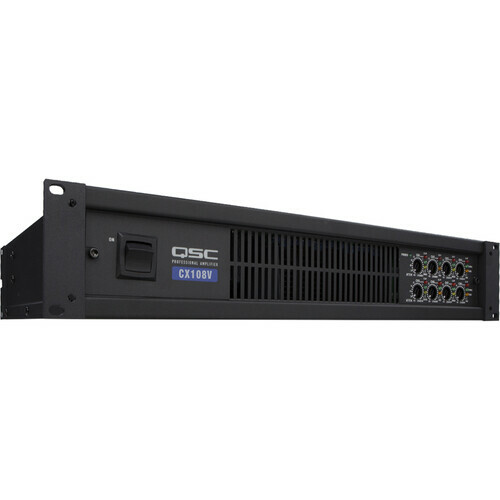 The QSC CX108V is a lightweight, rackmount, 8-channel 70V power amplifier with a custom security cover, built primarily for use in fixed installation sound systems. The 100 Watts/Ch. @70V unit, which may be bridged for 4 - 7 channel operation, offers a solid complement of controls and indicators, with detented rotary gain control knobs, LF filter switches, and clip LED's. Also featured is a set of 4 HD15 Dataports, one per channel pair, which enable computer-networked remote amplifier management and signal processing, using QSCcontrol software. The CX108V incorporates the design, cost-effective operation, and performance features that QSC is able to implement after three decades of experience building amplifiers serving all professional sound markets. Box Dimensions (LxWxH) 24.0 x 18.0 x 6.0"